Look, people like you. they find you helpful, like duct tape or a trusty socket wrench. I want you to teach me your secret. I want you to show me how to be a tool. Dr. Martin: You're a demon. Lucifer is the devil. How am I supposed to get over that? Maze: He's still the same old Lucifer. You're still Dr. Linda Martin. And, I'm still Maze. What's changed? Order off menu for once. Maze and I certainly won't judge. Permalink: Order off menu for once. Maze and I certainly won't judge. If I'm going to take this guy down, I need my partner, and that's you. Lucifer Morningstar. Permalink: If I'm going to take this guy down, I need my partner, and that's you. Lucifer Morningstar. Never fear. Luci-Dan is here. Permalink: Never fear. Luci-Dan is here. I think for the sake of the detective, I'm going to take a time-out from my Dans-formation. Permalink: I think for the sake of the detective, I'm going to take a time-out from my Dans-formation. Trixie: Do you like little kids? Maze: I've dealt with filthy, screaming humans before. At least these are smaller. Permalink: I've dealt with filthy, screaming humans before. At least these are smaller. People like you. They find you helpful like duct tape or a trusted socket wrench. Permalink: People like you. They find you helpful like duct tape or a trusted socket wrench. I'm going to learn how to douche. Permalink: I'm going to learn how to douche. Chloe: There's no way you can help me right now. You're just...you're too you. 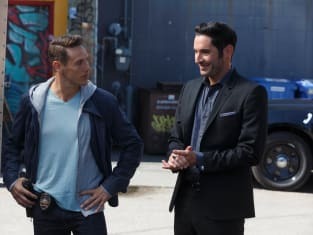 Lucifer: Yes, you're right, detective. Being me seems to be a problem, doesn't it? Permalink: There's no way you can help me right now. You're too...you. Lucifer Photo Preview: Dan is the Man!